Let’s Paint Some Acorns! – Let's Paint Nature! Do you know that nature never ceases to amaze me? How often I hike, how often I notice things around me and it seems that I always discover something new…something different. I hope I never run out of things to discover. I hope I never learn everything. I never want to be a know-it-all. On a simple hike, I found some red oak acorns. One in particular stood out, as it had a tiny hole near the top. I propped this acorn up with a white wire so that the hole was front and center. Step 1: This is going to be a graphite and watercolor sketch on illustration board. 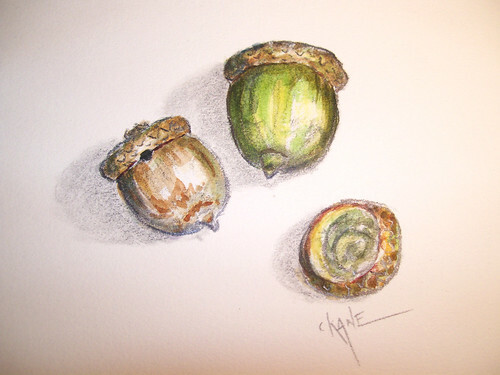 With a 4H graphite pencil make a loose sketch of the acorns. Don’t forget the shadow of the acorns. If you do not include shadow, it will look like your subjects are floating. Settle down little acorns, we do not need you floating in air! Step 2: Now, because this is a graphite sketch we do not want to cover that up completely, the watercolors we use will be minimal and almost dry. 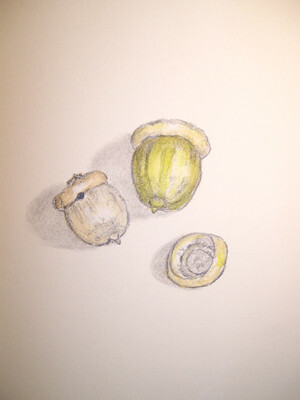 First, I took a lemon yellow and painted the entire big acorn, skipping the section where light was touching. Next I took an bit of orange on a dry brush and painted the medium acorn avoiding the part where light was the brightest. When everything was dry, I painted a thin sap green glaze on the large acorn and the acorn cap on the bottom right corner. Step 3: This step is subtle, that’s because I do not want to cover the graphite. I like graphite and I want to see it. In this step I took some orange watercolor on a dry brush and painted the medium acorn top and acorn cap. Step 4 Final: I made another dry layer of sap green on the large acorn and sienna on the medium acorn. With ultramarine blue, I painted shadow on the sides of the acorns and top. 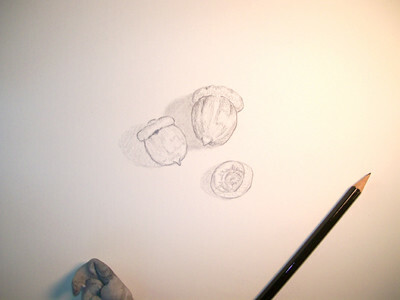 When everything was dry, I took a 4B graphite pencil and outlined the hole and “scales” on the acorn tops. What is best part of this story? 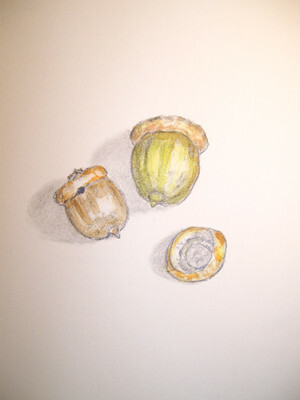 Well, I sketched my first acorn and had had to leave unexpectedly. 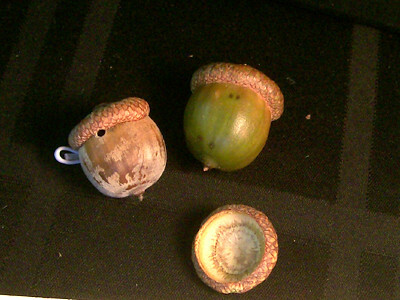 When I returned to finish, a thin white film was covering the hole of the medium acorn. Oh! Maybe I missed that? Was that there before? I took a sharp knife and scrapped off the white film covering the hole. As I finished my painting, about 20 minutes later I noticed another white film covering the hole. What the heck? There’s something inside!!! It is actively trying to cover the hole! Alright, I’m sorry Mr. Larvae, I must saw your home open and inspect what is going on inside. 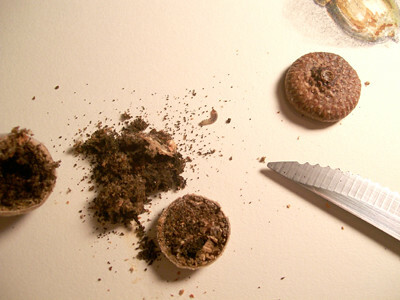 No acorn nut inside, but pulp and a tiny acorn weevil larvae. Funny, I carried this insect at least a mile back to my car. Safe in my pocket and had no idea. Hello my friend. Did a bird cause the hole in the acorn, trying to get you out? To have you for dinner? No, the hole was probably made by a female acorn weevil, who flies up to the acorn in the tree and drills a small hole, laying an egg inside. 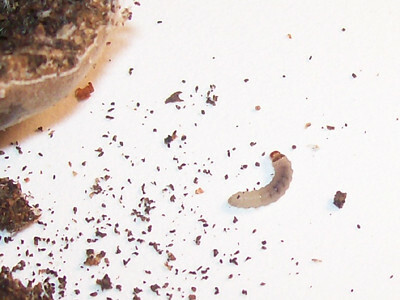 The larvae feeds on the nut and after the acorn drops, leaves the acorn through the hole. It then digs into the soil to overwinter for a few years before emerging as an adult to mate and make more holes. I released this larvae in my garden. Best wishes to him. I needed to uncover the secret and discover something new. Nature never disappoints. ← Let’s Paint Trees at Dusk! Poor little maggot!!! !You broke into his home,tipped out the contents then put him in your garden where he had nowhere to hide and nothing to eat thereby denying him his destiny which was to metamorphose into an acorn boring wasp or similar———-shame on you! As soon as I saw the hole in the 1st picture I KNEW something had to be living inside. 🙂 Beautiful painting, as usual. I wish I had your tenacity! Lana: Thanks, I was surprised to find a little friend!